In order to use in-app purchases, your app must provide a list of Products for sale. You can do this through scripting, or using the Codeless IAP Catalog (Window > Unity IAP > IAP Catalog). Whichever implementation you use, you must define the appropriate attributes for each Product. This page covers these attributes in detail. Enter a cross-platform unique identifier to serve as the Product’s default ID when communicating with an app store. Important: The ID may only contain lowercase letters, numbers, underscores, or periods. Note: For more information on Subscription type support, see the section on Subscription Product support. This section defines the metadata associated with your Product for use in an in-game store. Add Translations for the Title and Description fields by clicking the plus (+) icon and selecting an additional locale. You can add as many translations as you like. Use this section to add local, fixed definitions for the content you pay out to the purchaser. Payouts make it easier to manage in-game wallets or inventories. By labeling a Product with a name and quantity, developers can quickly adjust in-game counts of certain item types upon purchase (for example, coins or gems). Note: This functionality is only available in Unity 2017.2 or higher. Note: You can add multiple Payouts to a single Product. 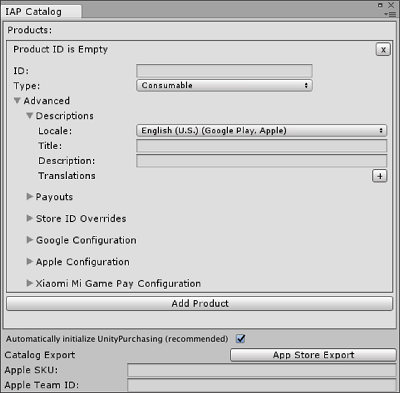 Note that the IAP Catalog acts as a Product catalog dictionary, not as an inventory manager. You must still implement the code that handles conveyance of the purchased content. By default, Unity IAP assumes that your Product has the same identifier (specified in the ID field, above) across all app stores. Unity recommends doing this where possible. However, there are occasions when this is not possible, such as when publishing to both iOS and Mac stores, which prohibit developers from using the same product ID across both. In these cases, use the override fields to specify the Product’s correct identifier where it differs from the cross-platform ID. In this example, the Product identifies as “100_gold_coins_google” to Google Play and “100_gold_coins_mac” to the Apple App Store. Note: Overrides only change the identifier Unity IAP uses when communicating with app stores. You should still use the Product’s cross-platform identifier when making API calls. Provide either a Product price, or an ID for a Pricing Template created in Google Play. Populating Google Configuration fields for Products in the IAP Catalog GUI. Select a Pricing Tier from the dropdown menu. Unity supports predefined Apple price points, but not arbitrary values. Select a screenshot to upload. For information on screenshot specs, see Apple’s publisher support documentation. Populating Apple Configuration fields for Products in the IAP Catalog GUI. Select a pricing tier (Chinese yuan) from the drop-down menu. Unity supports predefined Xiaomi price points, but not arbitrary values. For more information on publishing IAP Catalogs for Xiaomi, see documentation on Xiaomi integration.